Eve works at her home in a cottage surrounded by woods! Following her career as a primary school teacher and the birth of her two daughters, Eve began working as a counsellor, first with Relate and then privately. 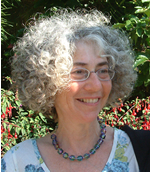 In 1990 she continued her psychotherapy training with BCPC (Bath Centre for Counselling and Psychotherapy) and completed it with ReVision, Centre for Integrative Psychosynthesis, London in 1995, when she first registered with UKCP (United Kingdom Council for Psychotherapists). Eve has co-facilitated a Diploma in Psychosynthesis Counselling at Wiltshire College for 7 years as well as training counsellors in Cheltenham and The Forest of Dean, Gloucestershire. She has been a visiting trainer at ReVision in London. Her heart lies in her own unique blend of approaches which incorporates Psychosynthesis, a Jungian orientation and bodysoul. Eve is also an experienced group leader and inspiring teacher. She has run groups since 1989. Her popular groups at Hawkwood College, Stroud, Gloucestershire incorporate working with story, ritual, visualisation, seasonal celebration, movement and art and craft. She is particularly interested in story, dreams and creativity.